Colorbond vs HardiFence? Good question. 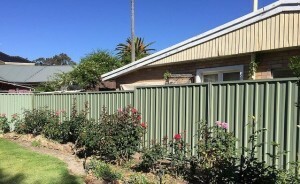 Two of the most popular domestic fencing options in Perth and Bunbury, Colorbond and HardiFence, have a lot in common. Both enhance privacy and security, and both offer a similar finished look. But, at the end of the day, how do they measure up and which one is right for your property, budget and needs? We’ve listed the most important differences and similarities in this post. Can be designed to hold up to strong winds. Should not be placed in windy areas. Post and panel, which can allow pets to dig underneath. Buried 600 mm into the ground, keeping snakes out and pets in. Has set colours, without the option of having a different colour on each side of the fence. There is a way to work around this, but at a cost. Has no colour, allowing you and your neighbour to paint the colour of your choice on either side of the fence. A range of fencing profiles to select from. Can retain soil up to 600 mm with the use of specially designed steel plinths. Should not retain any soil. Offers the option of having lattice or slats on top of your fence as a special feature. Apart from capping, it’s very difficult to add lattice or other features on top. Not ideal for a backyard where sports are played, as panels can be dented. Not easily damaged by soft balls. Thinner material, making it slightly less soundproof. 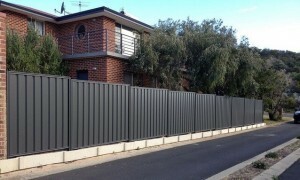 Fibre and cement, making it a better choice of fence for keeping out sound by noisy roads. Easily repaired in most circumstances. Costly to repair or replace. Mostly built in Western Australia only. The most fundamental difference between Colorbond fencing in Perth or Bunbury and HardiFence fencing is the materials that are used to produce the fences. Colorbond panels are manufactured using a patented steel made by a leading Australian steel maker called BlueScope and feature a colour bonded to the metal. Genuine Colorbond is resistant to fire, corrosion and pests, like termites. It comes with a 10-year warranty. HardiFence (HardieFence by James Hardie) is made from strengthened cement fibre sheets that are lightly corrugated and interlock, with aluminium capping added for support. Hardie fencing is also resistant to fire, rot and pests. However, it is not covered by a warranty. Colorbond comes with the colour bonded to the steel. While one could paint the fencing later, it is a time-consuming process with an end result that isn’t nearly as long-lasting as the original bonded colours. 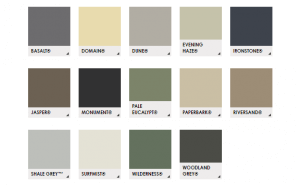 There are 14 options to choose from at the time of writing this, but one can track updates on Colorbond fence colours on the Colorbond website. HardiFence, on the other hand, does not come in a finished colour. This can be great for custom-matching paints. The surface of HardieFence is ideal for painting, and there are unlimited shades available. There’s also the option of not painting and keeping the neutral colour of the fence, which complements most outdoor decors and landscaping. In terms of maintenance, Colorbond vs HardiFence are nearly identical. Both fencing types are easy to maintain, requiring only an occasional washing and that the base be kept free of debris. If the bottom rail on your Colorbond fence is exposed to soil moisture that does not drain out, then corrosion may occur. This will also void the warranty. HardiFence, like Colorbond, looks the same from both sides. This a desirable attribute for most property owners, as it provides a consistent look that keeps neighbours happy with the overall appearance. Although Colorbond tends to be more prone to denting, Hardie fences can be dented if hit hard enough with a ball or similar object. Both types of fencing are dent resistant, though. 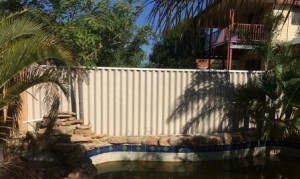 A lot of people assume that HardiFence fencing is cheaper than Colorbond. This may have been the case a couple of decades ago, but not anymore. 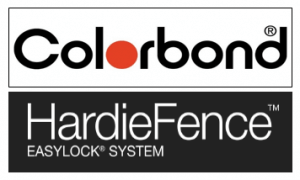 In fact, many property owners in Australia are surprised to learn that Colorbond typically works out around 30% cheaper than HardiFence when installed by professional fencing experts. The reason Colorbond generally costs less these days is because it is produced on a much larger scale. The material has come down in price as it is now used for all types of building applications on properties, including for roofs and garages. The physical labour that goes into putting up a Hardie fence is also double that of a Colorbond fence. So which is best when it comes to Colorbond vs HardiFence? That depends upon your specific needs and preferences. Most property owners opt for Colorbond, as it offers some advantages, but if you’re looking for attractive, low-maintenance fencing that is difficult to scale and will effectively make a space more private, either fence would be a wonderful choice. Want to learn more? Contact Team Work Fencing Contractors Today. Our experts can set up a free consultation with a no-obligation quote to get your Perth or Bunbury fencing project started!